Every year I throw a fun-themed birthday party for each of my kids. Party planning is so much fun! 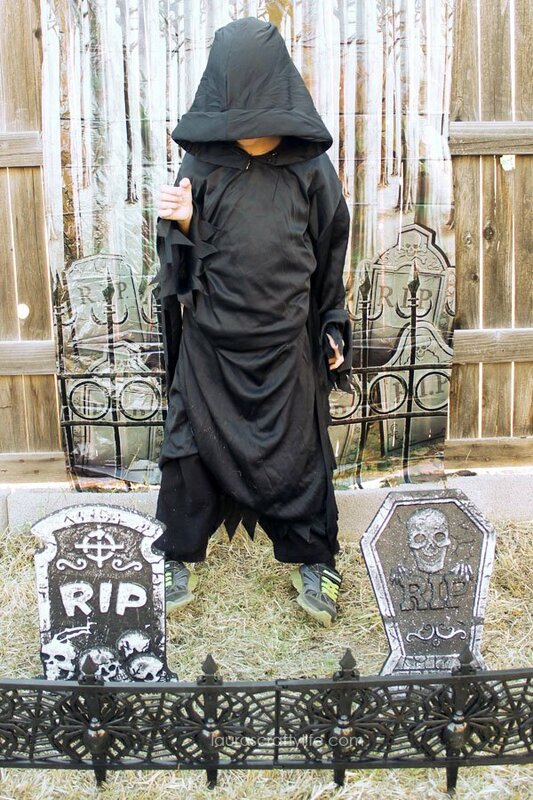 Last year, my son decided on a Halloween theme for his 7th birthday. I normally decorate a little for Halloween, but last year I was able to go over the top! 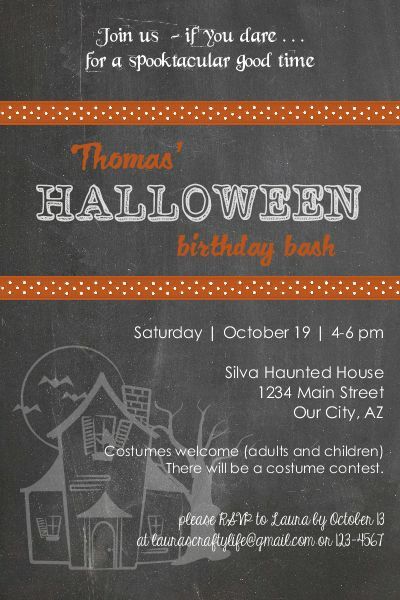 I started by creating a spooky party invitation. 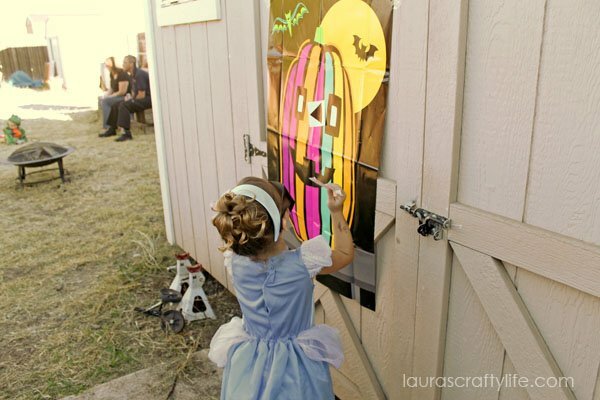 We invited everyone to wear a costume to the party – both grown ups and children. 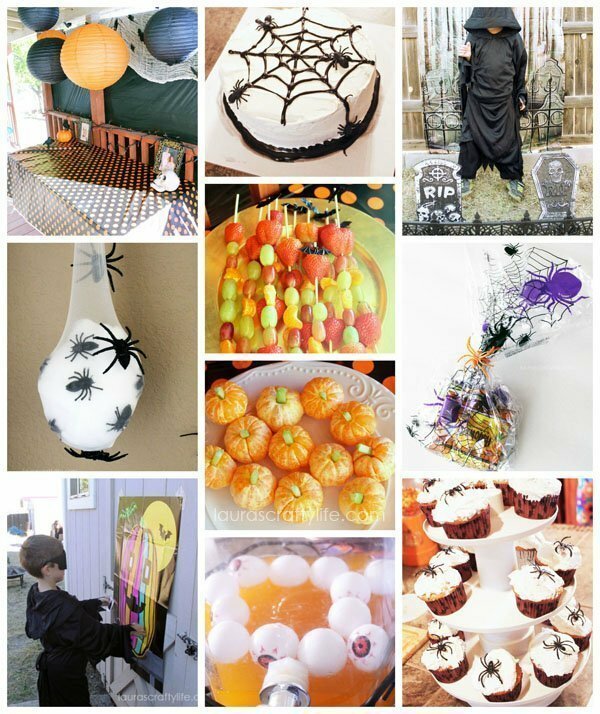 It was a Halloween party and birthday party all in one! Next up, came all the decorations. I decked out our front entry way table (my faux mantel). 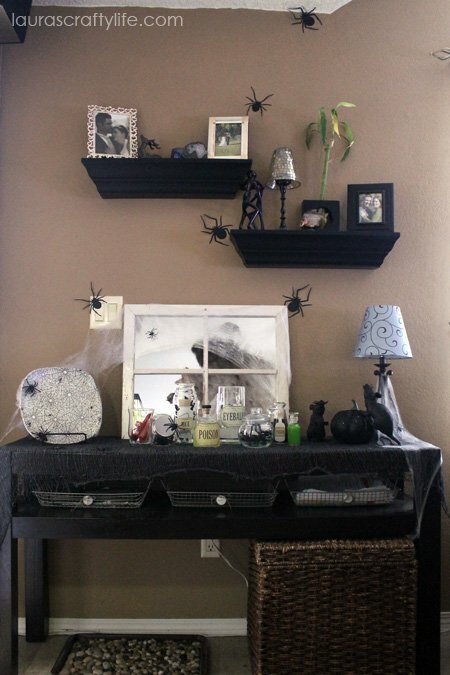 I created a spooky spider display from an idea I found at Martha Stewart. Start by gathering your supplies. 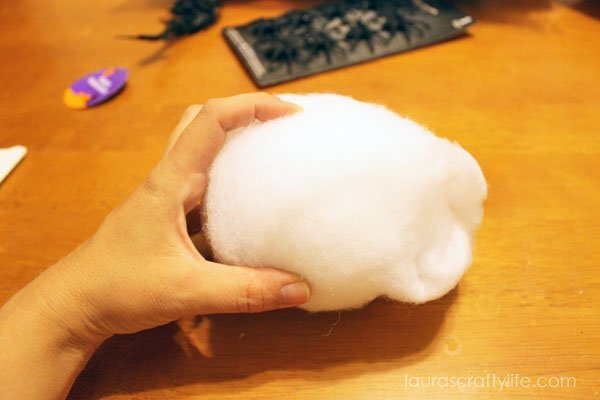 You will start by wrapping your foam sphere with the white batting. Place the wrapped foam sphere into your stocking. I cut one of the legs off the pair of stockings first. Start adding in spiders around the sphere until you feel like you have enough. 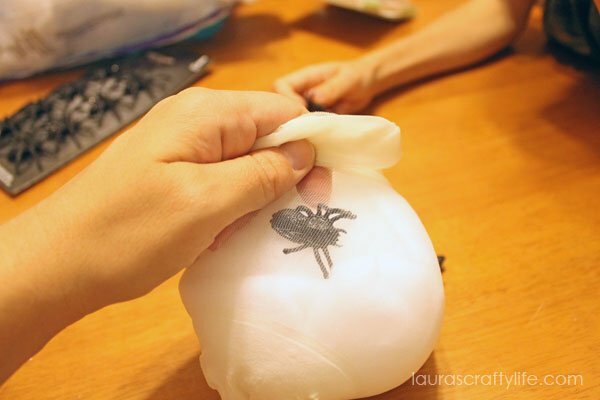 Next, you will hot glue on spiders to the outside of the stocking as well. Hang to the ceiling using a push pin. 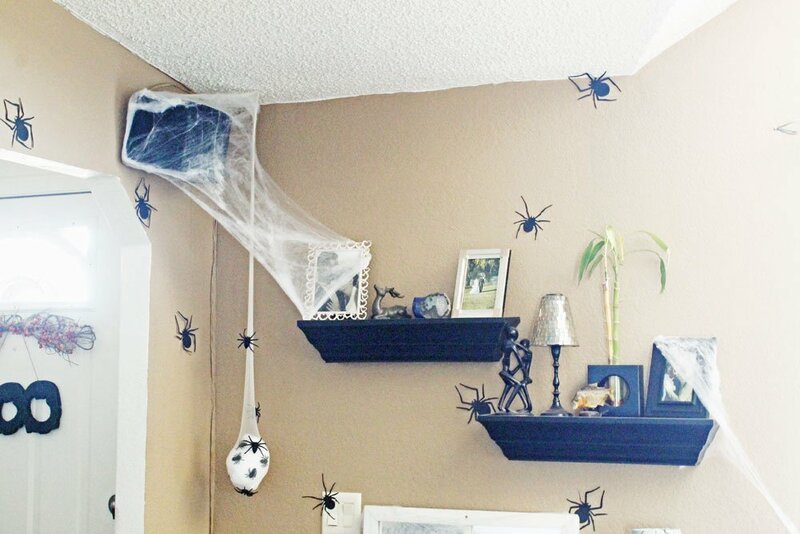 I added paper spiders to the wall starting at the table area and moving all the way up to the hallway entrance. 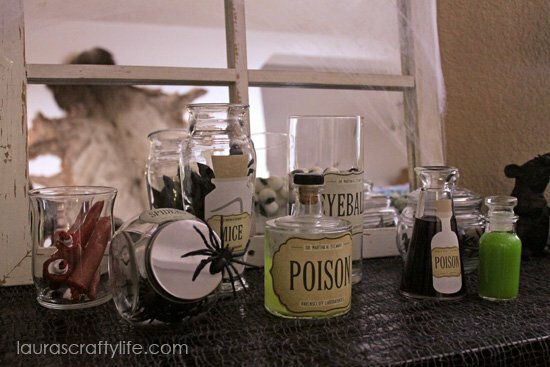 On the front table we had a scary apothecary jar display. 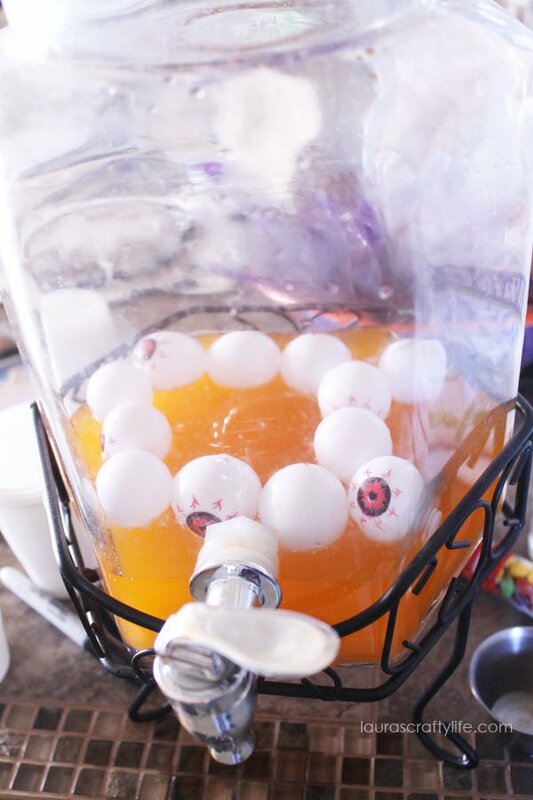 It had spiders, eyeballs, snakes, poison and other creepy items. 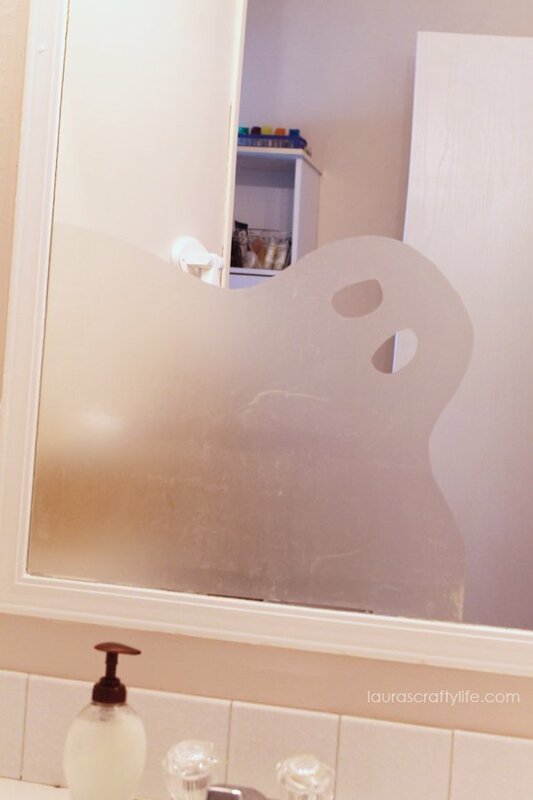 We added our spooky ghost to the bathroom mirror. 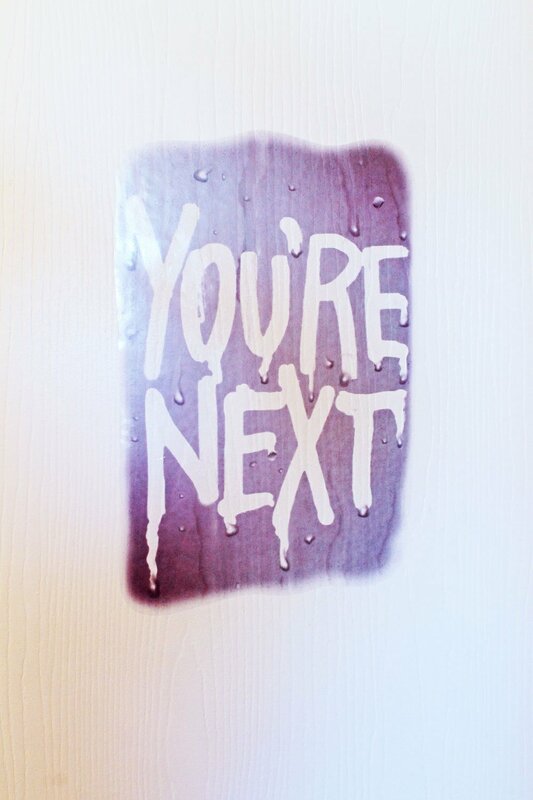 I also added a vinyl sign that said ‘you’re next’ to the back of the bathroom door for people to see once the door was closed. 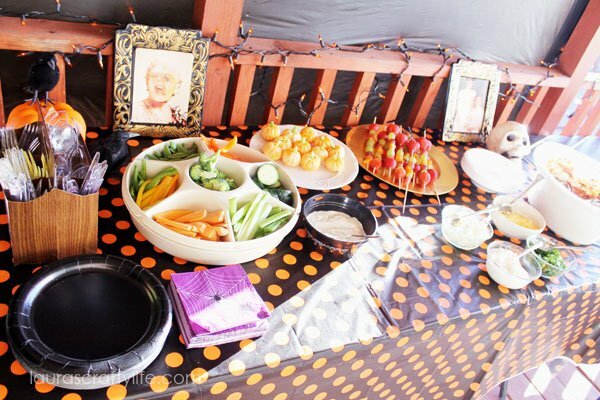 For the party table, I used a fun orange and black polka dotted vinyl tablecloth I found at Target. 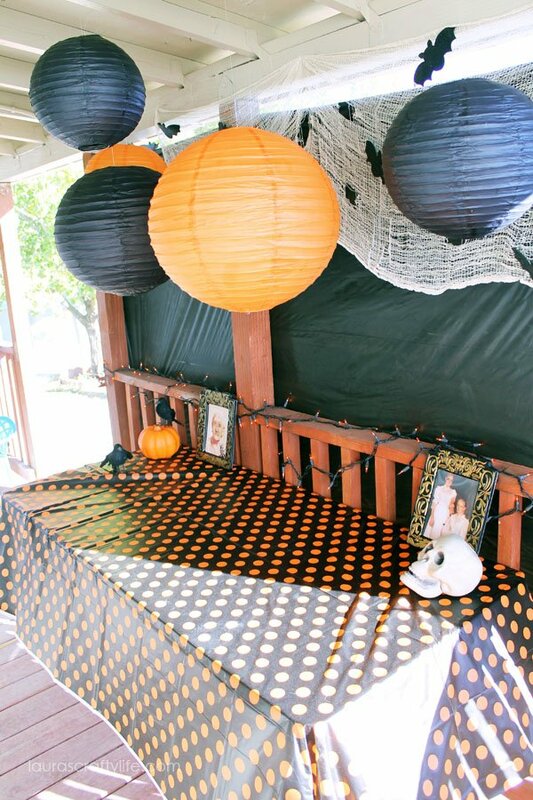 I hung orange and black paper lanterns. I hung creepy cloth up and placed some foam bats in it. 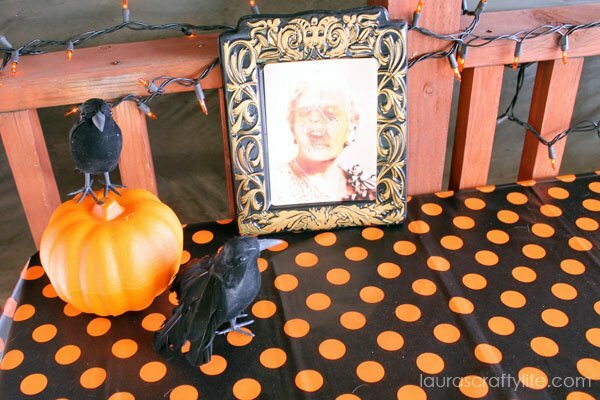 I found some fun accessories at the Target dollar spot and Dollar Tree – these creepy holographic pictures, skeleton skull, pumpkins and ravens. I made some Halloween themed food as well. We had clementine pumpkins. 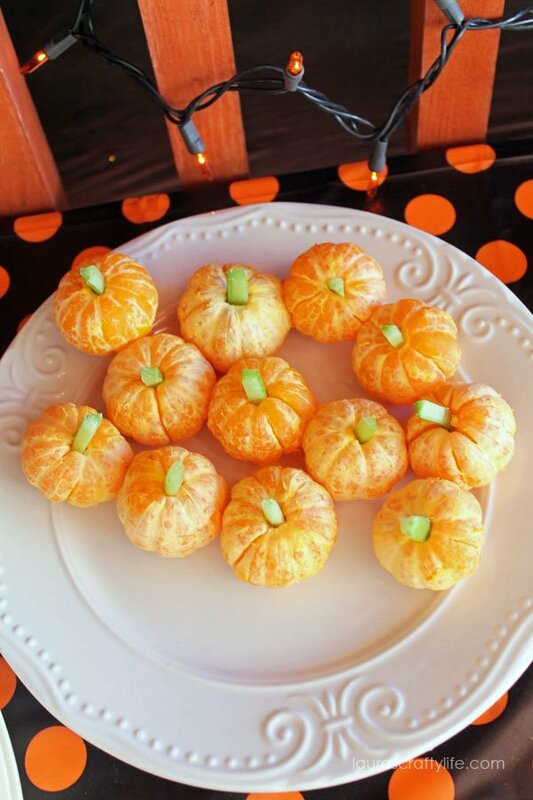 Simply peel your clementine oranges, and use a small piece of celery for the stem. 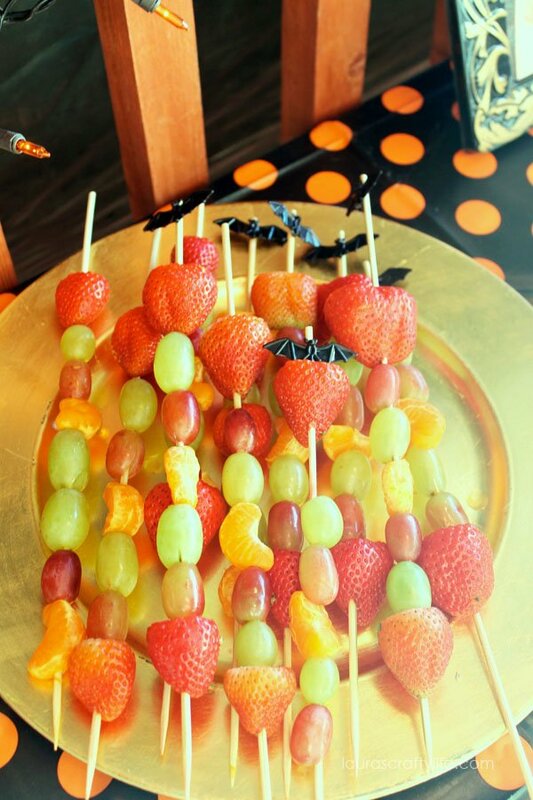 We had bat fruit kabobs. I cut the bats off of some plastic bat rings and hot glued them to the kabob sticks. Add fruit, and you are done! For the cake, I made a regular round cake with white icing. 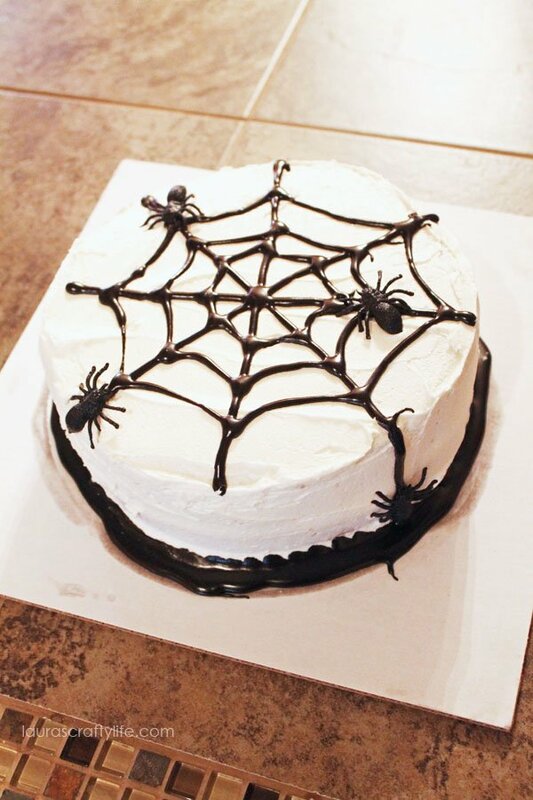 I used black icing to create a spider web effect. 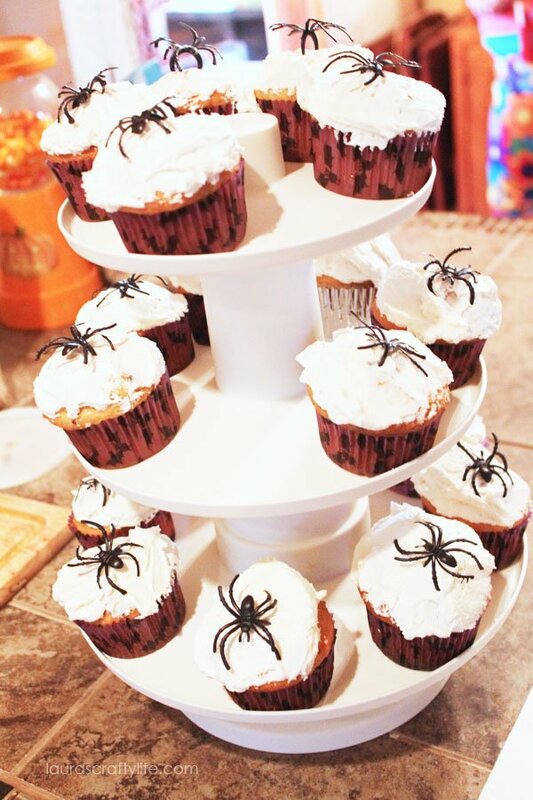 I added some plastic spiders on the cake. For the cupcakes I iced them with white buttercream icing. 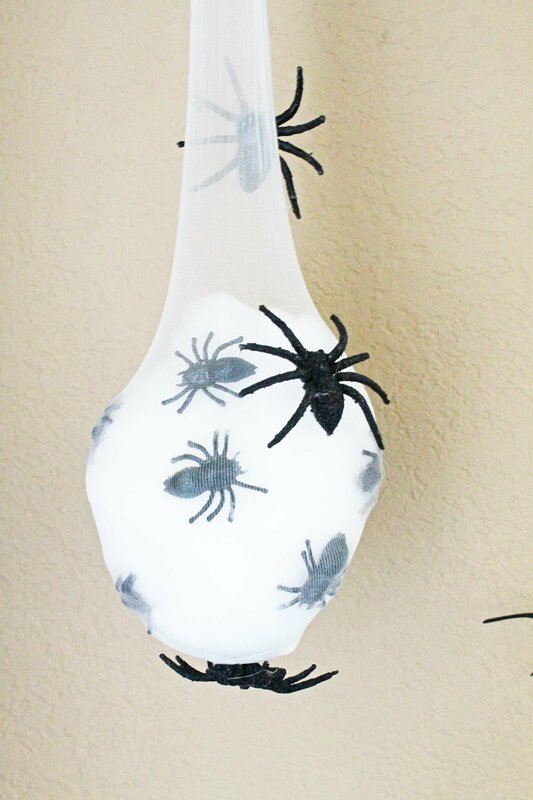 I added black plastic spider rings for decorations. I set up a graveyard photo area. I used a plastic back drop and hung it on the fence. I set up a little spider fence and placed some foam grave stones behind them. 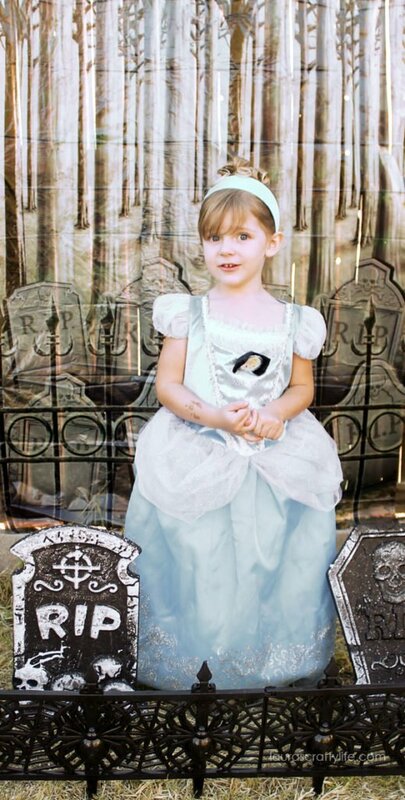 I took a picture of each of the kids in their costumes in the grave yard. I printed them out and sent them with the thank you cards. 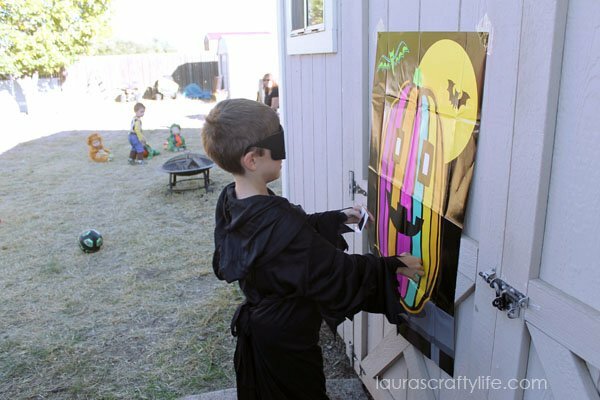 For party games, we did a pin the nose on the pumpkin. I purchased this from Target. We also had a ghost pinata. It was fun to see all our friends in their costumes. My husband and I dressed up. 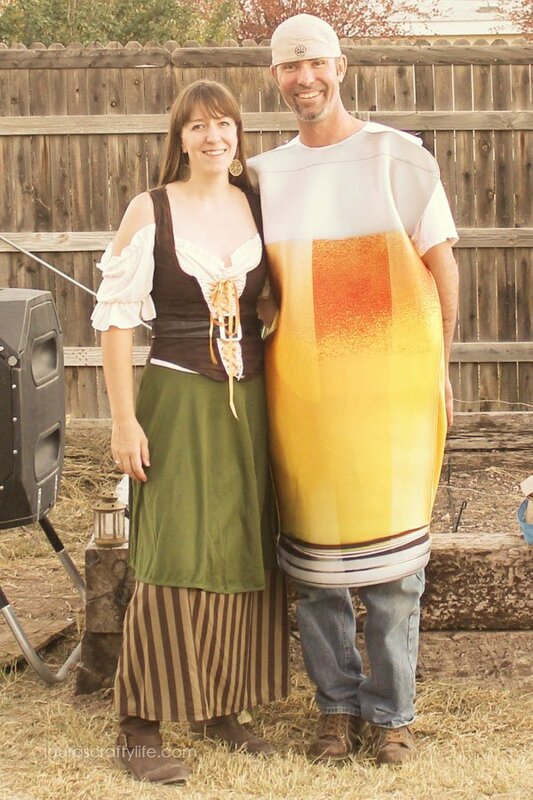 I was the bar maid and he was a beer. It was pretty funny! We had a costume contest that the birthday boy got to judge. Each of the winners got a little prize. 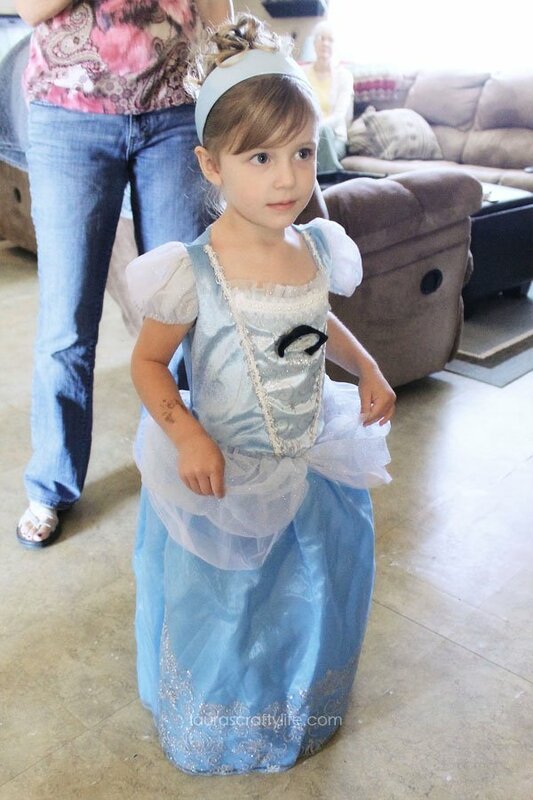 My daughter dressed up as Cinderella. 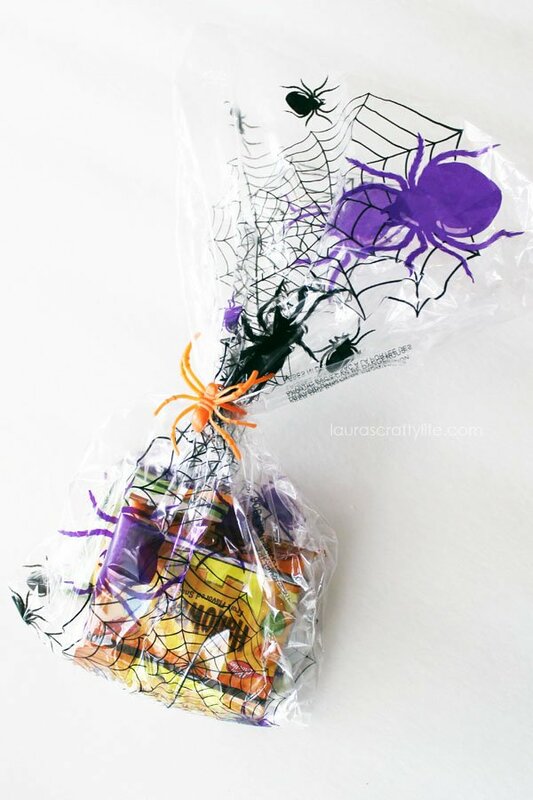 For the treat bags, I found some clear cellophane spider bags. 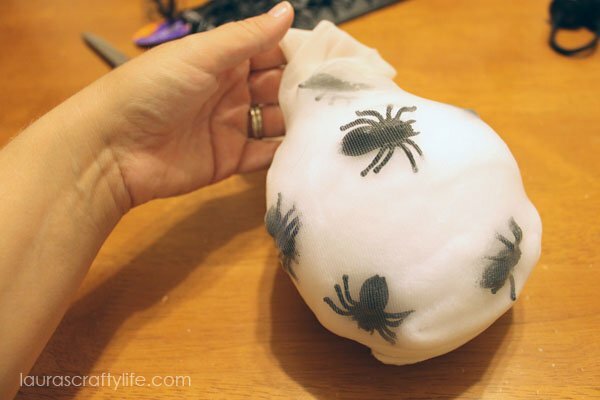 I ‘tied’ the bags with a spider ring. 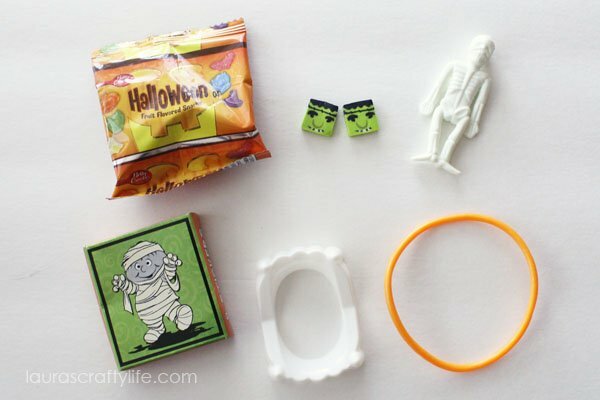 Inside each bag, the kids got a Halloween fruit snack, mini erasers, a stretchy guy, a pack of stickers, vampire teeth, and a jelly bracelet. 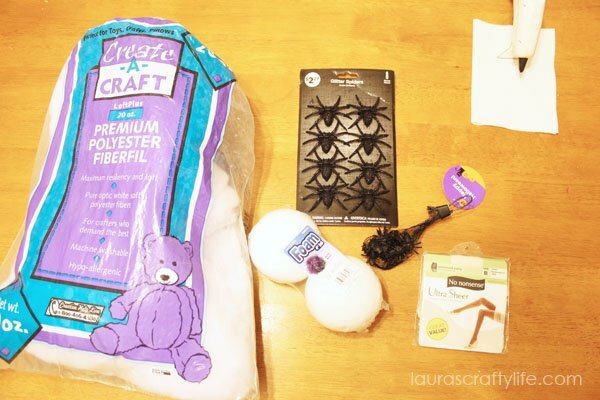 These ideas would work well for any Halloween costume party. 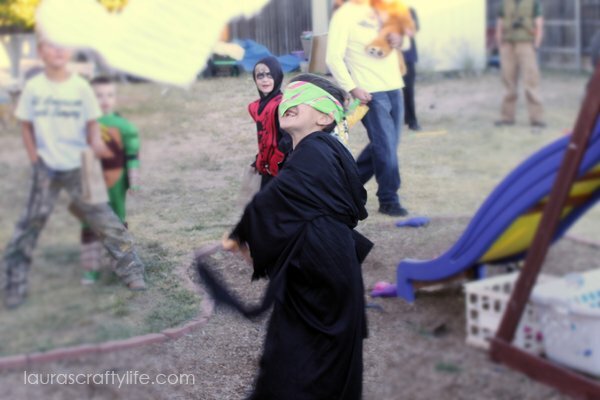 What kinds of fun birthday parties have you thrown for your kids?